DI Elias Svensson and his team of special investigators in the National Operations Department of the Swedish police are faced with a highly complex case where the perpetrator of several brutal murders leaves no tangible evidence. The investigators are convinced they know who the killer is, but gathering hard evidence to secure a conviction seems impossible. The suspect is highly intelligent, manipulative, cold and lacks remorse - in short, he has all the markings of a psychopath. What could be more dangerous? No stone is left unturned in the hunt for the killer, and Elias goes as far as bringing in a resource from the outside to shed light on the suspect’s unique psychological profile and MO; author Cornelia Lind. Cornelia has had personal experience of people with antisocial behaviour and psychopathic tendencies, and after writing the definitive text on the subject, she’s the perfect resource for the police. But at what cost to herself and her safety? 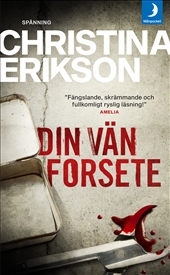 THE RISING DARK is the first book in the Forseti series with DI Elias Svensson and author Cornelia Lind in the lead. This is the author’s first book at Albert Bonniers Förlag.